Multi-objective Evolutionary Algorithms (MOEAs) are popular approaches for solving multi-objective problems (MOPs). One representative method is Non-dominated Sorting Genetic Algorithm II (NSGA-II), which has achieved great success in the field by introducing non-dominated sorting into survival selection. However, as a common issue for dominance-based algorithms, the performance of NSGA-II will decline in solving problems with 3 or more objectives. This paper aims to circumvent this issue by incorporating the concept of decomposition into NSGA-II. A grouping-based hybrid multi-objective optimization framework is proposed for tackling 3-objective problems. Original MOP is decomposed into several scalar subproblems, and each group of population is assigned with two scalar subproblems as new objectives. In order to better cover the whole objective space, new objective spaces are formulated via rotating the original objective space. 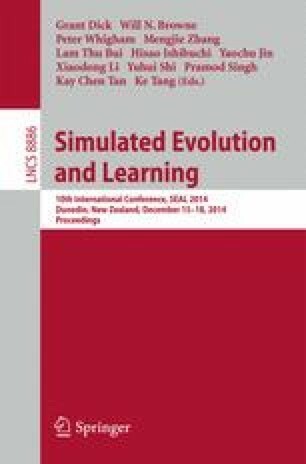 Simulation results show that the performance of the proposed algorithm is competitive when dealing with 3-objective problems.